"...if you have any concerns about the sanctity of life and our rights as Americans, you will want to view this DVD. (Nashville, TN) – The National Right to Life Committee (NRLC) will hold a special screening of the new documentary, The Terri Schiavo Story, at their national convention June 18-20 in Charlotte, North Carolina. Additionally, NRLC endorsed the film in their National Right to Life News which is sent out to nearly 400,000 subscribers. Four years after her death, the ethical and cultural implications of her case are still being felt throughout society and continue to spark debate. Just last year during the Democratic debates, President Obama said one of his “regrets” as a Senator was voting for Congress to intervene to save Terri’s life. Hosted by author and speaker Joni Eareckson Tada, who became personally involved in the case in 2005, The Terri Schiavo Story sheds new light on the controversial decision that led to the death of a 41-year-old disabled woman. In 1990, at the age of 26, Terri Schindler Schiavo suffered a mysterious cardio-respiratory arrest for which no cause has ever been determined. She was diagnosed with hypoxic encephalopathy - a neurological injury caused by lack of oxygen to the brain. Terri was placed on a ventilator, but was soon able to breathe on her own and maintain vital function. She remained in a severely compromised neurological state and was provided a PEG tube to ensure the safe delivery of nourishment and hydration. On March 31, 2005, Terri Schindler Schiavo died of marked dehydration following more than 13 days without nutrition or hydration under the order of Circuit Court Judge, George W. Greer of the Pinellas-Pasco's Sixth Judicial Court. directives) are quietly removing the feeding tubes from brain-injured people when families abandon their responsibilities. Feeding tubes are providing basic care, not medical treatment." atrocity that it was and that anyone who claims that her death was 'peaceful' and 'painless' is lying. It is because of the truly inhumane nature of death by dehydration that when people are killed this way it is always done behind closed doors in the strictest secrecy. I wholeheartedly believe that if the public had been allowed to witness Terri's suffering first hand, the outcry would have deafened Florida and the world." Tada was on the front lines with Terri's family in 2005, helping lead the protests that eventually landed in the halls of the U.S. Congress. "I hope that people understand that Terri Schiavo's story is really our story," says Tada. "We have a special obligation to protect the weak and vulnerable in our society. We have a responsibility to uphold their human dignity -- because we are of equal dignity, we are not at each other's disposal. The weak and the vulnerable need their rights safeguarded and protected... we must not allow them to become eroded. For when we do, we are jeopardizing the rights of us all." Originally produced as an episode for the Joni & Friends television series, Franklin Springs Family Media felt the story was compelling enough to produce as a stand-alone project. Their decision was recently justified when The Terri Schiavo Story won the Jubliee Award for Best Documentary at the San Antonio Independent Christian Film Festival. 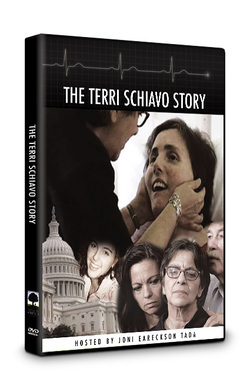 Additionally, the Dove Foundation, known for their high standards in family entertainment and their "Family-Approved' Seal, has given The Terri Schiavo Story its highest rating of five stars. National Right to Life exists to protect innocent human life, including the unborn and the medically- vulnerable from threats such as abortion, assisted suicide and euthanasia. NRL was formed in 1973 as an umbrella organization – a non-profit, non-sectarian organization that could coordinate right to life activities in Washington, D.C., and in the states. NRL’s strength lies in its direct connection with the state and local grassroots pro-life movement through its board of directors and various programs. Visit www.NRLC.org for further information. For more information and to view a trailer for the new documentary, visit: www.TheSchiavoStory.com. For more information on Franklin Springs Media, visit: www.FranklinSprings.com.